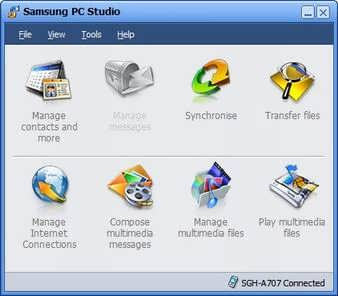 Samsung PC Studio is a Windows-based PC program package that you can use easily to manage personal data and multimedia files by connecting a Samsung Electronics Mobile Phone (GSM/GPRS/UMTS) to your PC. - Allows you to select the connection type for PC to Phone connection. - Allows you to view, edit and organise the personal information in your phone on your PC. It also lets you copy and move information between your phone and your PC. application, when it is connected to the phone. Microsoft Outlook and Outlook Express. - Allows you to manage multimedia files in your phone on your PC and to transfer files between your phone and your PC.